Alan Dickens has praised the Saints players for how they have 'steadied the ship' since the departure of Jim Mallinder. Mallinder was dismissed as director of rugby in December, bringing an end to his 10-year tenure at Franklin's Gardens. Saints endured a horrible end to 2017, losing 12 of their final 13 matches in all competitions during the calendar year. 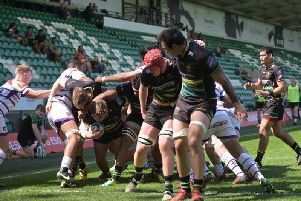 But since the start of 2018, they have been victorious in all four home matches as well as winning at Sale Sharks to help to secure an Anglo-Welsh Cup semi-final clash at Bath. Dickens, who was previously the club's attack coach, was made interim head coach following Mallinder's exit, with Alan Gaffney drafted in as technical coaching consultant. And Dickens is enjoying the current setup. "Well, my wife and kids don't really see me," he said, smiling, "but I've enjoyed it, it's been an experience and one I'll take some positives from as well as some lessons. "I'm continually looking to improve. "It wasn't the most ideal of situations with Jim going. I hold Jim in high regard and it was a difficult period. "I certainly think we've steadied the ship since the turn of the year and all credit to the players - they're the ones who go on the pitch and put their bodies on the line. "In recent weeks, they have been fantastic." Several current Saints squad members are out of contract this summer, with the likes of Ben Foden, Stephen Myler and Tom Stephenson currently facing uncertainty. Dickens does not believe that has changed their performance levels for the worse or the better, but he admits he does feel for those involved in contract anxiety. "The players play and put their bodies on the line week in, week out, whether they're playing for a contract or not - that's certainly what I was like when I was playing," he said. "It's an unfortunate situation they find themselves in and hopefully it can be resolved sooner rather than later." Dickens has been working closely with Gaffney since the experienced Australian arrived at Saints for the start of 2018. And he has revelled in teaming up with a man he suggested would be able to help Saints when Mallinder left the club. "I've known Gaff for 11 years since 2006, when I first came across him at Saracens," Dickens said. "Everyone keeps telling me what a lovely bloke he is, and he is, but when you get on the training pitch and do analysis, he's as stern as they come. "I find he's a positive influence because he drives standards and he gets the players to improve."